Rwanda Development Bank (BRD) has secured a $5 million line of credit from “Banque de Development des Etats des Grand Lac (BDEGL) that would support the bank’s priority sectors. The credit will be paid at a fixed interest rate of 5%. According to Rutabana, the credit will fund Agriculture projects through value chain and affordable housing projects whose demand is impressively growing. 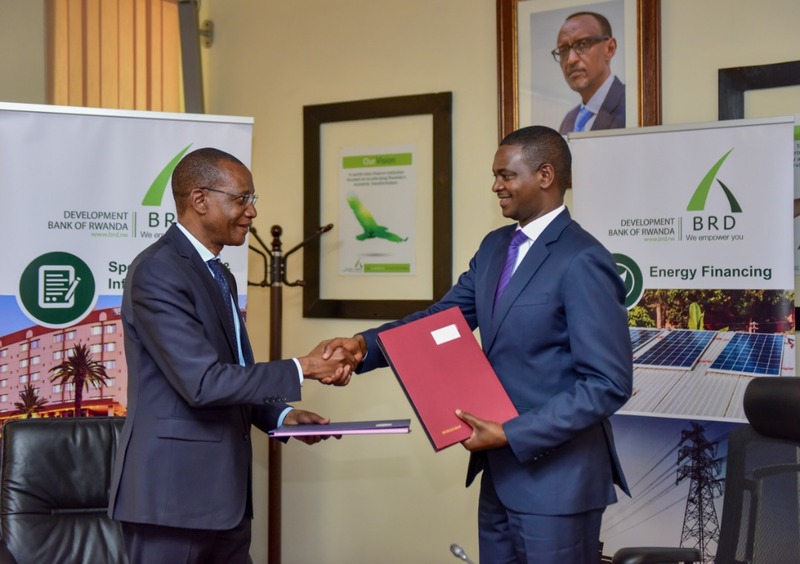 “We have also discussed other initiatives to be funded in the energy especially the renewable energy,” Rutabana said after signing the deal on Friday,August 31 at BRD headquarters in the capital Kigali. The deal which is part of the two banks’ partnership dated as back as 2015, was signed between BRD Chief Executive Officer Eric Rutabana and BDEGL Managing Director, Emmanuel Ntaganda. “This is a continuation of a fruitful collaboration between the two financial institutions that started three years ago,” Rutabana said after signing the deal at BRD’s headquarters in the capital Kigali. The latest signing of the credit line between the banks pushes the figure to $16million since the partnership three years ago. Started in 1977 with headquarters in Goma – Democratic Republic of Congo(DRC), Banque de Developpement des Etats du Grand Lac provides loans and other services to promote economic development among member states. Members include Burundi, Rwanda, and the Democratic Republic of the Congo. Rwanda and Burundi own 18% of the bank each, while DRC owns 34% of the bank. The rest is owned by minor shareholders. The bank credits its clients for their compliance in paying back the loans. Currently, BRD is a stand-alone complaint in paying back the credit compared to other Development Banks in member states. “BRD has been the best compliant in paying the credit. They are always two weeks ahead of payback period, but even other clients pay,” Ntaganda said.